His name is Sollog and he just created a whole new genre of literature. 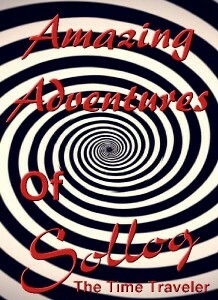 In the Amazing Adventures of Sollog the Time Traveler Book 1 The Red Pill, Sollog takes you into his incredible mind and explains how he time travels into the future and the past. Sollog poses the question to the reader over and over in his new book, this is my reality that you live in with me, yet my mind viewed these things before we lived them, so are we all really inside a matrix? For fans of the Amazing Sollog you know he is already world famous for his Prophecies. Now Sollog explains exactly how he explores the Universe bringing back new theories in math and physics as well as glimpses into our future and our distant past. Sollog implores the reader to decide if his writing is Fiction or Non Fiction and if any of us even exist at all. Sollog has singlehandedly destroyed the concept of physics that we have in a Universe based on time and space and a linear direction to time. In Sollog”s story the Universe is as he theorized in his great word on astrophysics a Hologram Universe. So Sollog is now merging his theories into the realm of fiction and in doing so he has blown a hole in the illusion we call life. Sollog puts forth a compelling argument that proves HE KNOWS THE FUTURE. Then he takes it to the next level by saying time travel is real and you can do it with just your mind and here is my technique to hijack the operating system of our Universe and control time. Is Sollog really a time traveler? Link after link in his new eBook proves to most that read his story he KNOWS THE FUTURE, so if we ask how does he know the future, the answer Sollog provides is simple. He is a Time Traveler and now you can read about the Amazing Adventures of Sollog the Time Traveler. If you roll into one work the Matrix, the Time Machine, A Hitch Hikers Guide to the Universe and Alice in Wonderland as well as the Cosmos with the Prophecies of Nostradamus and perhaps Einstein’s General Theory of Relativity, you start to scratch the surface of this great new work in Literature. The only question is what do we call it? Sollog has listed it in Science Fiction Time Travel on Amazon while throughout the book he urges the reader to take their next Red Pill (a new chapter) so they can see our Universe isn’ t really what we perceive. 5 Stars isn’t enough for the book that changes everything. You can get download info for the 10 books in this great new series at I Time Travel .